Archipelago CTXM Slot Guide & Review - Casino Answers! Archipelago is a 5-reel, 25-line video slot developed by CTXM, featuring a wild symbol, expanding wilds, a free spins feature and a bonus game. You can play the Archipelago video slot at Bovada Casino. Bets on the Archipelago slot machine are $0.05, $0.10, $0.25, $0.50, $1, $2 and $5 per line. You can select from 1-25 paylines by using the “Bet One” button. Archipelago is a nickel slot, so you can play anywhere from $0.05 per spin up to the maximum total bet of $125 per spin. This is a very good betting range that any online casino player will be satisfied with. To play Archipelago, select your bet and press the “Spin” button or hit “Bet Max” to play with all 25 lines enabled. The top payout on the Archipelago online slot game is 2500 coins for 5 of a Kind of the highest paying symbol on a selected payline. The second highest payout is 1500 coins. The Magic Dish symbol is the wild symbol on Archipelago. It will substitute for any symbol (except for the scatter and bonus symbols) to complete winning combinations. Whenever it appears on the third reel, it will become a MegaWild (expanding wild) symbol, meaning the entire reel will become wild. If you trigger the MegaWild feature, you will triple your chances of winning when you play Archipelago at Bovada Casino. The Golden Cup is Archipelago’s scatter symbol. If 3, 4 or 5 Scattered Golden Cup symbols land on the reels of Archipelago, you will win 5, 10 or 15 free spins. You can win more free spins during the free spins feature. Payouts are made according to the Paytable. Payline wins are multiplied by the bet per line. All symbols pay left to right. Only the highest win is paid on each of the active paylines. Coinciding wins on different active paylines are added. The free spins feature can be re-triggered. You can play 5 or 10 autoplay spins on the Archipelago online slot. You can also hit the “Auto Spin” button to play more autoplay spins. You can play 5, 10, 20, 50 or 100 autoplay spins. You can stop the autoplay mode on Archipelago by hitting the “Stop” button or clicking anywhere on the screen. We can honestly say that we’re not knowledgeable enough about the topic here at Casino Answers to fully appreciate what CTXM has done with the Archipelago video slot, but we can tell you that there is something very interesting going on here. The bonus game is certainly the highlight of the Archipelago video slot. It’s not difficult to trigger at all and if you’re lucky enough to make it to the end, you will surely win quite a fair bit of cash. You can play the Archipelago slot game when you sign up and make a deposit at Bovada Casino! Are USA players able to play the Archipelago online slot for real money? Yes, American players are welcome to play Archipelago at their choice of Bovada Casino. 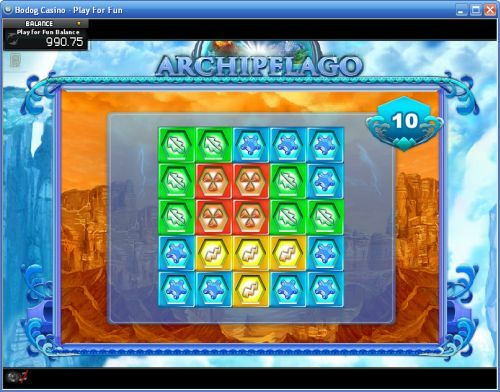 Can I play a free Flash game of the Archipelago video slot? Yes, you can try the Archipelago video slot out for free or you can play for real money at Bovada Casino without downloading any software. If you experience difficulties with the Instant Play casino, make sure you have the latest version of Adobe Flash Player.